With cold weather rapidly on its way, it is time to think about how the changing season affects the wooden furniture in your storage unit. If steps aren’t taken to care for your furniture, winter weather can significantly affect the condition of your items. Below are some tips to keep you covered. Rapid changes in the weather is tough on everyone and everything—even your wooden furniture that is being kept in storage. Think about your own body: when it is cold, your body dries out, and when it is warm and humid, you might retain more water. Hence, what you may not know is that your wooden furniture will probably change in the same ways while it is in storage. The reason for this is not the temperature, but the change in humidity. Wood adapts to its environment. It will expand when it is humid and contract when it is cold. The problem with these changes is that your furniture might become damaged over time. If you absolutely have to put your wooden furniture in a storage unit, it is important to look for facilities that offer climate-controlled storage units. These units include all the necessary features you need to keep your items in top condition: an air conditioner, heater, humidifier, and dehumidifier to control the conditions inside your unit. As you may know, wood will contract in the winter months and expand in the warmer months. The result of this constant change is cracks, discolouration, and deformities, lessening its appeal and weakening its structure. High humidity can also result in your prized possessions becoming moldy and eventually lead to rotting. This also goes for any electronics, clothing, or books you currently keep in a storage facility or plan to keep with your furniture. Any moisture can reduce a stack of books to mush and leave those toys you were saving for your grandkids headed for the landfill. 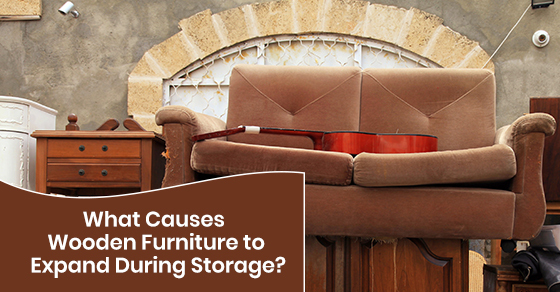 Avoid excess heat or dryness—it can cause your furniture to crack. If you decide to clean out your storage unit in the middle of the winter, leave the space heater at home! You do not want to expose your furniture to a heat source, not to mention that it is a fire hazard. Keep a dehumidifier in your unit in the summer or during a rainy period to avoid sudden changes to the air quality in your rental space. Remember, wood does best at around 20 degrees Celsius. No one wants to come back to their storage unit to find that their wooden furniture has been damaged by the weather, so it’s important to take preventative measures. The best measure you can take is to find a climate controlled storage unit to prevent your belongings from being impacted by the weather; with a climate controlled space, it won’t matter whether there’s a heat wave or ice storm. Your furniture will always be protected! If you are interested in renting a climate controlled storage unit, call Jiffy Self Storage today at (416) 745-4339 or contact us here.